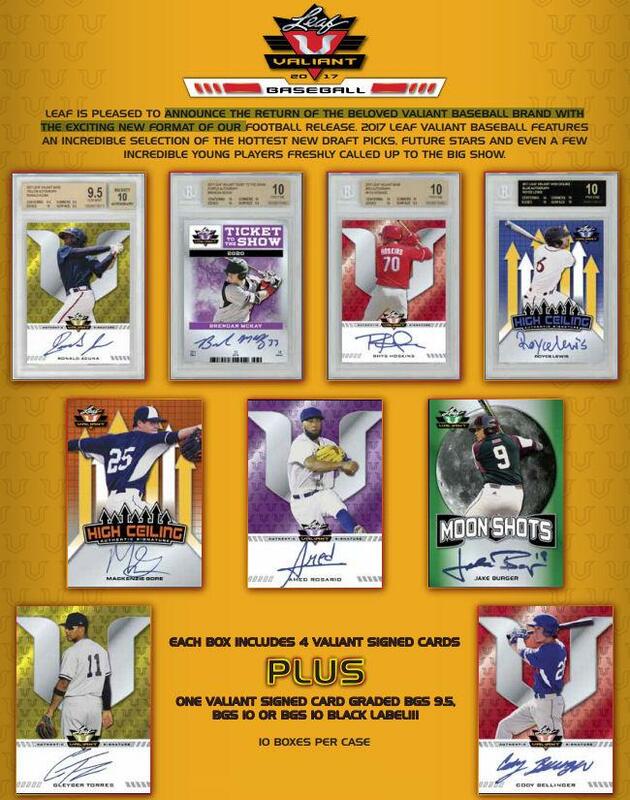 2017 Leaf Valiant Baseball ($104.95 per box) arrives this week at Sports Cards Plus following the enormously successful format of 2017 Leaf Valiant Football. Every box delivers 4 Autographs PLUS One Autographed Card graded BGS 9.5 or higher with possible BGS 10 Black Label Autographed Card. In addition to base autographs, there are a few inserts as well that also have autographs. Power-hitting prospects are showcased in Moon Shots. Ticket to the Show cards are somewhat reminiscent of Rookie Ticket Autographs in Contenders, only done with a chromium spin. High Ceiling Autographs are also randomly inserted. Colorful parallels run throughout 2017 Leaf Valiant Baseball. As far as the checklist goes, there’s a mix of 2017 draft picks, international standouts, some players nearing the majors and a couple who have already made it. Like 2017 Leaf Metal Draft Baseball, Valiant has autographs from both Cody Bellinger and Rhys Hoskins. Based on the checklist below, only 340 10-box cases of 2017 Leaf Valiant Baseball were produced. Go to Sports Cards Plus to pick your box from The BEST CASES in The Hobby at The LOWEST Price in The Galaxy.